Tarantulas capture the imagination and fascination of keepers and thrill seekers alike. From the early b-movies to the incredible nature films of today, tarantulas have captured the imagination of seasoned invertebrate hobbyists and the general public too. Their slow, methodical walk, furry legs, and mysterious nature have produced an important place in the exotic pet trade for the tarantula. If you enjoy keeping tarantulas, you're in good company. Tarantulas are the foundation of the invertebrate hobby and make wonderful pets for thousands of keepers. Keepers of these intriguing animals observe behaviors that are subtle, important, and not seen elsewhere in the pet trade. More and more people are coming to enjoy the novelty and intrigue offered by these unique pets. And beyond the thrill of having an unusual pet, tarantulas are often the driving inspiration that creates budding invertebrate specialists. Tarantulas do not bark, will not ruin your furniture or carpet, and they will survive and even thrive with a minimal amount of care. If they are well-fed and have access to water, they can be left for a week or two while a keeper is away on business or a vacation. Very few pets can boast this hardiness. Most tarantulas available as pets are not dangerous, though you need to handle them with care and respect. There are actually no known tarantulas that are capable of killing people outright. All across the planet, various common names are used for tarantulas. Sometimes these names cause confusion in beginning keepers. Besides tarantula, they are called tree spiders, baboon spiders, and more. Many varieties of these fascinating creatures are available in pet stores and from breeders. This is not surprising as there are approximately 800 species of tarantulas. The first species kept in United States collections were mostly those found in the United States or Mexico as they were easiest to access. 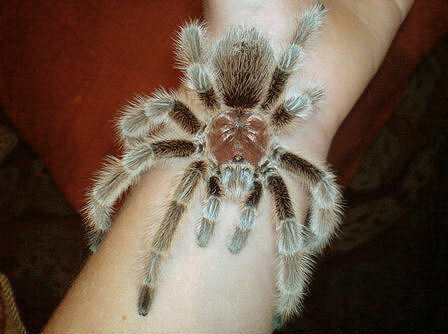 The Mexican Red-kneed Tarantula Brachypelma smithi has been a standard in the pet trade for many many years. African species arrived beginning in the late 1980's and early 1990's. They were first imported from European collectors and then as part of shipments of reptiles. A great number of species have entered the hobby (and are still arriving) and private collections are reaching incredible populations. As with reptiles, probably the most difficult species to obtain have been those from areas difficult for collectors to access such as parts of Africa and the Middle East. Also, species from countries that are typically unwilling to export any wildlife such as India, Bangladesh, Brazil, Australia, and many others. The list of arachnids below have guides for different types of tarantulas. Each guide provides facts and information and how to keep them as pets. Caresheets includes habitat requirements, foods and feeding, tips for handling, and more.